We’re leaving school today. Not going far, just to the butcher’s shop at the end of the road. He’ll show us how to joint a carcass of lamb and since we’re cooking really cheap meat dishes, he must persuade the class that cheap can be delicious. Large posters showing pig, beef and lamb are pinned on my classroom wall, free from the Meat and Livestock Commission. The animals have cuddly faces but the rest of the picture looks like a chainsaw massacre as their body parts have been hacked it into bits. Students must learn the names of each cut and know which pieces are tough or tender. We can’t afford to cook the tender bits, like fillet steak and pork chops, but we make tasty choices such as Lancashire hot pot, beef stew from skirt, and find many ways to cook beef mince. First I need parental permission so that my students can leave the school grounds. No-one should trot up the school drive without a note. I’ve seen the bands of naughty students skiving off through the fence at the bottom of the school playing field, but they’ve been too quick for me to chase for long, especially if I’ve got cakes baking in the ovens. Next week I am taking my group to the local butchers to learn about meat. Please could you give permission for me to take your son/daughter out of school for this lesson? I agree that Name of student… can go on the visit. The week before the outing is tense. If I don’t get all the signed forms back we can’t go. I suspect that many forms are signed by students, just like their sick notes or the ‘Jimmy could not do his homework because …’ letters. To raise the profile of my subject and get some school publicity, I’ve asked a photographer from the local newspaper to come to take snaps. I hope my group will impress him so that he will write about the importance of teaching boys and girls how to cook. We snake down the road in an ordered line and gather in the butcher’s shop. He heaves a lamb carcass onto the thick wooden block and sharpens his knives on a steel. This is manly, grown up stuff and my group are keen. As he deftly butchers fleshy chunks of meat from the large bones, the lamb is reduced to chops, shoulder and leg, and the cheapest bit that we are going to cook – the rather fatty but very delicious, breast of lamb. Oh no I didn’t. But it’s too late, and just reinforces the views that mum does the shopping and cooking, and the challenging questions asked by the dads of the future that day are just ignored. One day, I’ll get things changed. One day! Back at school Sylvia sharpens our filleting knives and the butcher delivers a pile of plump lamb breasts with strict instructions that they must be the same size and not cost more than 50 pence. Each cooking place has a plastic tray containing a breast of lamb with a pink stamp on the skin stating New Zealand Lamb, which is the cheapest at the time. The boys jostle for the largest breast, moving from tray to tray like a game of musical chairs. Boning meat is a very skilled task and I want no fooling around. We’re using sharp knives, which are normally locked away, safe from harm. Sylvia and I count them out and count them back in at the end of the lesson. No-one dares to leave the room until all knives are returned. I use my VERY STERN VOICE for this serious task. The rib bones are carefully cut from the flesh of the breast. They gather round. Sylvia and I patrol the group like lions watching their young at play, encouraging, warning, and keeping an eye for their safety. We collect the bones, fat and gristle in a large bin for Mr Davey in history to take home for his dog. I show them how to tie the joint with string using butcher’s knots. There are no quips today. This is impressive. No chat back. Miss is deadly serious and she will take no nonsense. 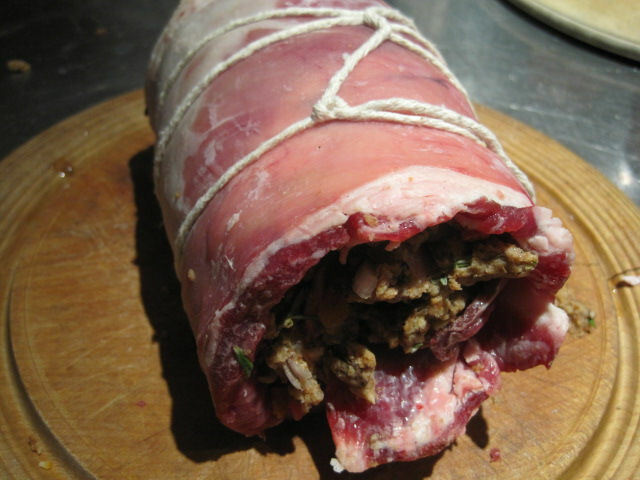 A line of neatly tied and stuffed rolled breasts of lamb appears on my table for marking. The butcher would be proud to sell them in his shop. Beside each one is a clean knife. I don’t want anyone munching on raw lamb on the bus home. They pack and go and once again the room is a culinary haven filled with roasting lamb, and sage and onion stuffing. It feels nourishing and nurturing and I know that these new skills will set them up for family meals in the future – and they might even pass the exam! Buy a breast of lamb in one piece with all the bones still in it. Use a sharp knife to cut round each rib bone. Don’t pierce through the skin. Take out the rib bones in one piece. Cut off any big bits of fat. Make the stuffing with a dried sage an onion stuffing mix or make your own from bread, onions and herbs mixed with egg. Put the boned breast of lamb flat on chopping board, with the skin side on the board. Smooth the stuffing evenly over the top. Roll up the breast of lamb starting with the thin end. Squeeze it into a roll and then tie with string. Rub the outside with salt. Set the oven at 150 c, Gas 4. Place the lamb on a roasting tin and roast the joint slowly for two hours, so that the fat melts out and the meat is tender with some crackling skin on the outside. Pour any excess fat into a large glass jar. Do not pour down the sink as it sets solid in the u bend and is impossible to budge! Put the roast potatoes in after about an hour and baste with some of the fat. Serve with some green vegetables and gravy. Carve the meat by cutting into medium slices, lifting them so that the stuffing doesn’t fall out. Put in a warm oven to keep warm until ready to serve. In the 70’s New Zealand lamb sent demonstrators into British schools and provided us with recipe books and teaching resources including large posters to go on the wall. Mutton was also on the menu. The brand mark New Zealand was stamped on different parts of the animal. When the UK joined the EEC in 1973 it was still a major market for NZ sheep meat and New Zealand sheep exports were allowed preferential access as a transitional measure from 1973 to 1977, as New Zealand had voluntarily restricted exports. After 1977, meat exports were subject to the European Union’s Common External Tariff of 20%. In 1980, New Zealand agreed to limit sheep meat exports to the European Union. Today more than 70 per cent of the New Zealand lamb sold in Britain comes from halal slaughterhouses so that the New Zealand meat industry can sell its lamb in Muslim markets round the world.